The end of the fall semester at SFU is approaching, and I figured it was time for some indulgence before I legitimately start those hectic days of cramming for final exams. 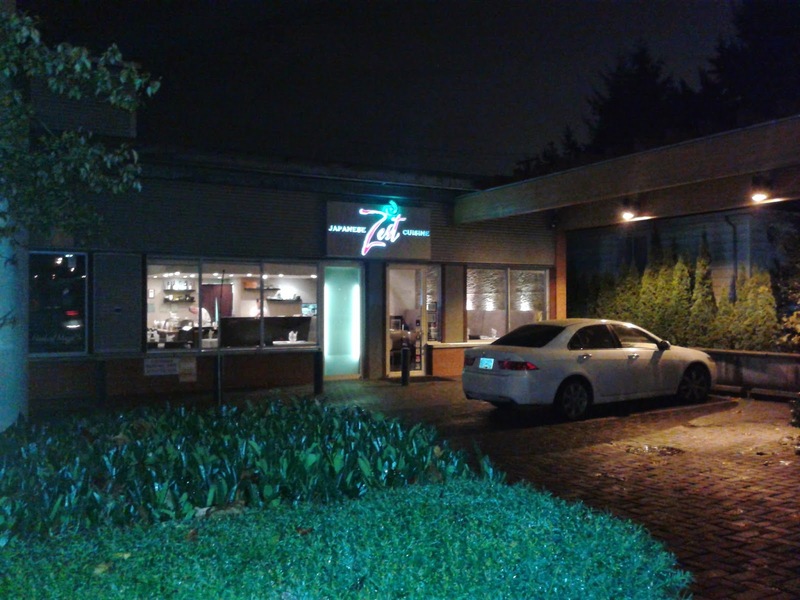 For some reason, Zest became my restaurant of choice as it served Japanese food with a bit of a modern twist. When I arrived at the intersection of Macdonald St. and 16th Ave., I looked around for the restaurant but could not spot it at any of the corners. I actually started to panic because I was literally starving (I pretty much skipped lunch) and getting the address wrong was absolutely the last thing I would want to happen. I walked over to Starbucks (on the northeast corner) and stole some Wi-Fi to see if I indeed got the address wrong. Nope, it turns out that I just didn't see the restaurant because it had no street sign and was hidden on 16th Ave. behind the Starbucks. I walked in to find a medium-sized restaurant with a high-class ambience and tables neatly covered with white linen tablecloths. The lighting is comfortably dim at the dining tables, but I thought this was a little uncomfortably contrasted by the much brighter area around the sushi bar. When I walked into the restaurant shortly before 6 p.m., it was mostly empty, but the waitress told me that all of the tables were reserved except a window seat which was free until 7:15 p.m. 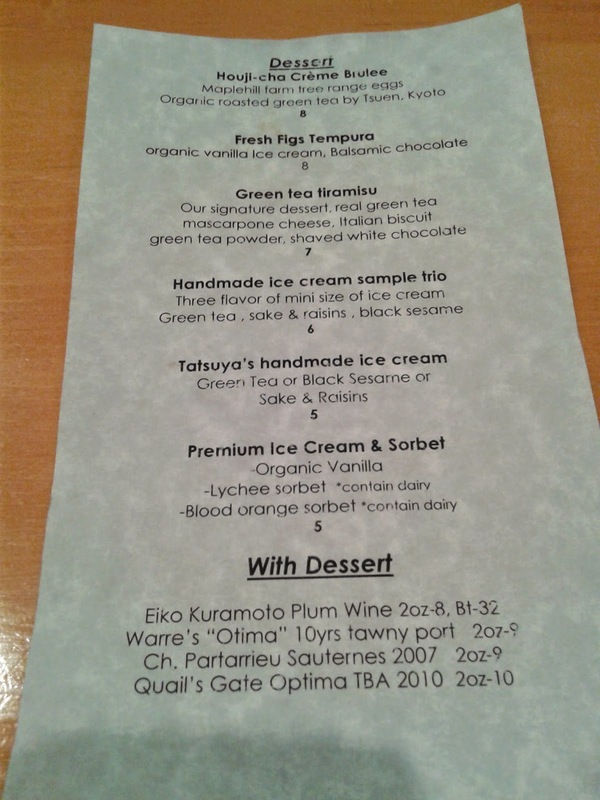 I chose to sit at the bar instead, where the owner chef, Yoshiaki Maniwa, and the executive chef, Tatsuya Katagiri, were already busy preparing the dishes ordered by the first customers to arrive for dinner. I was sitting on Chef Yoshi's side of the bar, observing his knife skills. He slides the knife through the sashimi displaying both elegance and ease, and each piece is cut very evenly and with just the right thickness. I was expecting Chef Yoshi to prepare the Assorted Sashimi Salad, but as soon as he learned that I ordered it, he passed the task off to Chef Tatsuya. 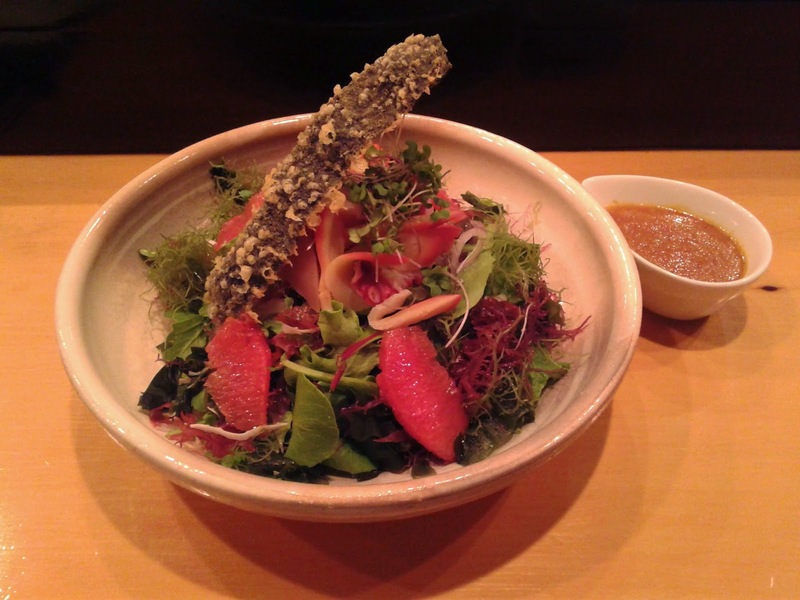 The Assorted Sashimi salad came with an organic spring mix, fresh sashimi from the raw bar, assorted seaweed, fresh grape fruits, nori (seaweed) tempura, micro mustard green. In a small container on the side was the Zest original soy onion dressing. I found six types of sashimi inside the salad: Albacore tuna (B+), ahi tuna (A-), hokkigai (A+), madai (A), sockeye salmon (A+) and tako (A). Overall, the sashimi was very fresh and had brilliant flavours. I was most impressed with the sockeye salmon sashimi (there were 3 pieces of it too! ), which had a perfect smooth sheen and was remarkably soft. The piece of nori tempura was fried to just the right crispiness and greatly exceeded my expectations. The Zest original soy onion dressing went very well with the salad greens (not so much with the sashimi or the seaweed) and it had a nice tangy flavour while the hint of soy gave it a sense of uniqueness. I also learned that at Zest, each dish is served one after another, instead of all at the same time. 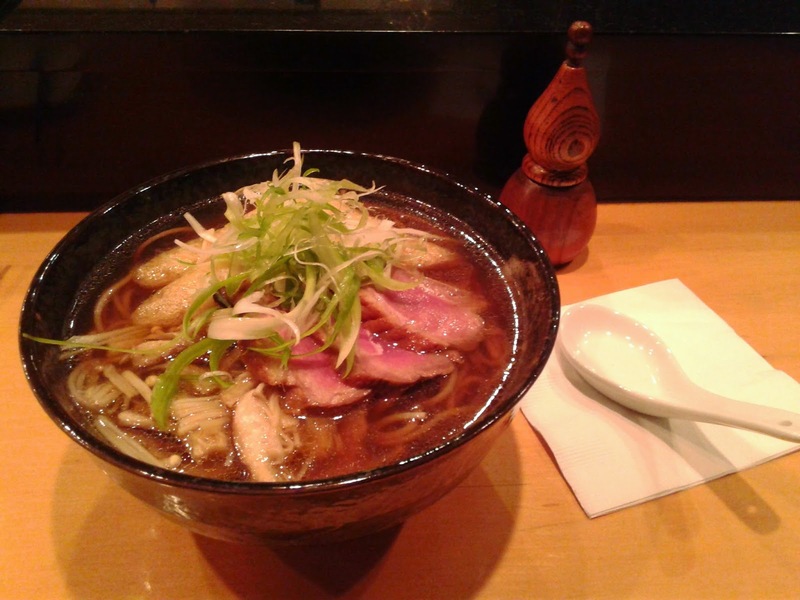 The Kamo Nanban Soba was a warm filler dish that consisted of roasted Yarrow Meadows duck breast, green onion, fried soybean curd and assorted mushroom in Ichiban dashi and duck broth with a hint of Yuzu Zest. The duck was roasted to medium rare and had a smooth texture, but I found it slightly tough. On the other hand, the fried bean curd had a nice rebound and absorbed the flavouring from the duck broth well. The addition of duck broth gave the soup a richer flavour than it would have been if was just plain dashi. Overall, there was a good sense of harmony among the different ingredients used. The Ocean Pacific Roll consisted of tiger prawn tempura, asparagus, smoked salmon, seared mozzarella cheese, red and yellow pepper, and creamy wasabi sauce. I was secretly hoping this would be prepared by Chef Yoshi so I would get to experience the skills of both chefs, but it turns out that Chef Tatsuya was responsible for the rolls. It was neatly constructed, but the sushi rice wasn't exactly spectacular. I found the smoked salmon to be rather mild in flavour, though I liked the thin seared coating of cheese. It would be nice if it had even more of a smoky flavour (but any more searing and it would have turned the cheese hard). The tiger prawn tempura was quite thin in diameter, considering that tiger prawns were advertised. The asparagus, on the other hand, was added in just the right amount and it had a nice juicy crunch. 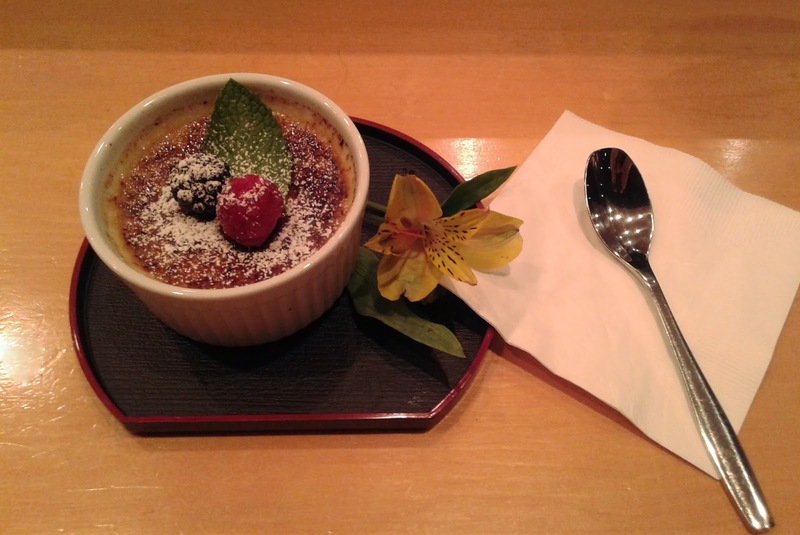 The Houji-cha Crème Brûlée was made with Maplehill farm free range eggs and organic roasted green tea made by Tsuen (Kyoto). It was garnished with a raspberry and a blackberry (coincidentally my two favourite kinds of berries) as well as a mint leaf. I was expecting the custard base to have a primarily green tea flavour, but it took on a vanilla coffee flavour instead (still with a hint of green tea), which I found just as delicious. My only wish was for the hard caramel layer on top to be a little thinner so that it would have a nice crispy texture (it was getting a bit sticky). The service was immaculate from beginning to end, though I found it interesting that they kept asking me if I would like more. My brain would have liked more, but my stomach said otherwise. In fact, the first two items each came in a larger portion size than I had expected, so I was able to keep the bill under the $60 while stuffing myself completely full. The highlight of tonight's meal was the fresh, vibrant flavours from the sashimi, though overall, the meal demonstrated decent preparation skills and consistent quality.